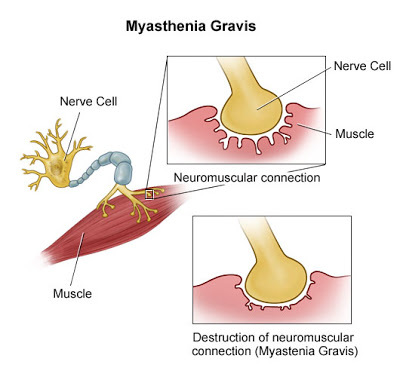 Myasthenia Gravis is a neuromuscular disease characterized by considerable weakness and abnormal fatigue of the voluntary muscles. A defect in the transmission of nerve impulses at the myoneural junction occurs. Causes include insufficient secretion of acetylcholine, excessive secretion of cholinesterase, and unresponsiveness of the muscle fibers to acetylcholine. MG, thought to be an autoimmune disorder, is caused by a loss of acetylcholine (ACh) receptors in the postsynaptic neurons at the neuromuscular junction. About 80% of all MG patients have elevated titers for ACh receptor antibodies, which can prevent the ACh molecule from binding to these receptor sites or can cause damage to them. MG is often associated with thymic tumors. This sudden onset of muscle weakness is usually the result of undermedication or no cholinergic medication at all. Myasthenic crisis may result from progression of the disease, emotional upset, systemic infections, medications, surgery, or trauma. The crisis is manifested by sudden onset of acute respiratory distress and inability to swallow or speak. Caused by overmedication with cholinergic or anticholinesterase drugs, cholinergic crisis produces muscle weakness and the respiratory depression of myasthenic crisisas well as gastrointestinal symptoms (nausea, vomiting, diarrhea), sweating, increased salivation, and bradycardia. Injection of edrophonium (Tensilon) is used to confirm the diagnosis (have atropine available for side effects). Improvement in muscle strength represents a positive test and usually confirms the diagnosis. MRI may demonstrate an enlarged thymus gland. Test includes serum analysis for acetylcholine receptor and electromyography (EMG) to measure electrical potential of muscle cells. Holding your arms above your shoulders until they drop is one exercise that may be performed during the Tensilon test. In this test, the drug Tensilon is administered, and the response in the muscles are evaluated to help diagnose myasthenia gravis or to help differentiate between myasthenia gravis and other conditions. Management is directed at improving function through the administration of anticholinesterase medications and by reducing and removing circulating antibodies. Patients with MG are usually managed on an outpatient basis unless hospitalization is required for managing symptoms or complications. Anticholinesterase drugs such as Pyridostigmine bromide (Mestinon), neostigmine bromide (Prostigmine); neostigmine methylsulfate can be given as a continuous infusion if the patient cannot take oral medication. Anticholinesterase drugs blocks the action of the enzyme anticholinesterase, thereby producing symptomatic improvement; atropine must be readily available to treat cholinergic side effects and medications must be administered on time, or the patient may be too weak or unable to swallow the drug. Monitor respiratory status and ability to cough and deep breathe adequately. Maintain suctioning and emergency equipment at the bedside. Monitor speech and swallowing abilities to prevent aspiration. Encourage the client to sit up when eating. Instruct the client to conserve strength. Plan short activities that coincide with times of maximal muscle strength. Monitor for myasthenic and cholinergic crises. Administer anticholinesterase medications as prescribed. Instruct the client to avoid stress, infection, fatigue, and over-the counter medications. Instruct the client to wear a Medic-Alert bracelet. Inform the client about services from the Myasthenia Gravis Foundation. 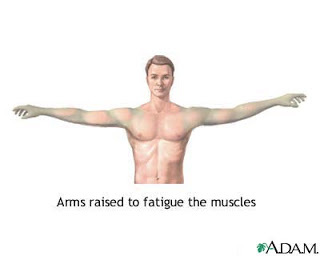 Instruct the patient and family on the importance of rest and avoiding fatigue. Be alert to factors that can cause exacerbations, such as infection (an annual flu shot is suggested), surgery, pregnancy, exposure to extreme temperatures, and tonic and alcoholic drinks. Instruct the patient and family about drug actions and side effects, the indications for dosage alteration, and the selective use of atropine for any overdose. Stress the importance of taking the medication in a timely manner. It is advisable to time the dose 1 hour before meals for best chewing and swallowing. Explain the potential drug interactions (especially aminoglycosides and neuromuscular blocking agents, which include many pesticides). Encourage the patient to inform the dentist, ophthalmologist, and pharmacist of the myasthenic condition. Instruct patients to wear MG identification jewelry. Suggest having an “emergency code” to alert family if they are too weak to speak (such as ringing the phone twice and hanging up). Instruct the family about cardiopulmonary resuscitation techniques, how to perform the Heimlich maneuver, how to contact the rescue squad, and how to explain the route to the hospital. Make a referral to a vocational rehabilitation center if guidance for modifying the home or work environment, such as a raised seat and handrail for the toilet, would be beneficial. Ineffective Breathing Pattern related to neuromuscular weakness of the respiratory muscles and throat. The patient will maintain an oxygen saturation of >92% and a respiratory rate of 12-20 with ADL’s. Assess for signs of activity intolerance. Ask client to rate perceived exertion. Rationale: Dyspnea on exertion, palpitations, headaches, or dizziness or patient states increased exertion level, are all signs of activity intolerance and decreased tissue oxygenation. Monitor pulse oximetry and report O2 saturation <92%. Rationale: O2 sat of <92% indicates the need to supplement oxygen. Monitor the patients pulse oximetry every 4-6 hours. Rationale: An O2 saturation of less than 92% may detect hypoxia and signals the need for supplemental oxygen. Rationale: Increases oxygen delivery to the body. Client is able to swallow independently without choking. Able to maintain a patent airway. Self-Care Deficit related to muscle weakness, general fatigue. Patient is able to perform self-care activities independently and able to demonstrates ability to use adaptive devices for completion on ADL’s. Observe the patient’s ability to perform activities of daily living. Rationale: This will show performance challenges and the level which the patient needs assistance with completing ADL’s. Allow enough time for task performance. DO not rush patient. Involve family and significant others in care activities. Observe activities to ensure patient can perform them safely without assistance. Rationale: Allowing sufficient time preserves the patients energy and increases activity tolerance. Patients say tired after doing the activity. Patient seems tired and listless. Patient was not able to take action to meet their daily needs. Patients can perform the activity gradually. Muscle weakness does not occur. 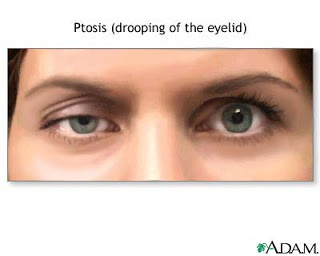 Assess the strength of muscles, ptosis, diplopia, eye movement, ability to chew, swallow, cough reflex, talk. Rationale: The rate of muscle weakness may be different in other parts of the body. Assess muscle strength before and after drug administration. Rationale: Knowing the effects of drug administration. Perform scheduled breaks, keep quiet surroundings. Rationale: Period after the break, increased muscle strength. Impaired verbal communication related to muscle weakness. Patients appear to difficulties in verbal expression. Changes in behavior are not willing to communicate. The use of sign language / body. Patients expressing themselves verbally or non-verbally. Assess the patient’s ability to speak with the examination of cranial nerves V, VII, IX, X, XII. Rationale: knowing the patient’s ability to speak. Ask a closed question, yes or no or body movements. Rationale: Facilitate patient easily answered. Rationale: Can see the speaker’s lip movements. Use images, paper or other means. Rationale: Using media allows patients to express desire. Inform staff or family, about the limitations of the patient in communication. Rationale: Communication patterns that one would add to the frustration of patients.